Here at Renray Healthcare comfort is one of our top priorities. With the Challenging Environments Reclining chairs comfort is exactly what you will achieve. Whether you are looking for manual, electric or bariatric reclining chairs, our range has it all. 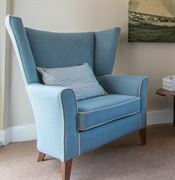 All reclining chairs are also available in a range of fabrics, therefore there is no need to worry whether we have something to match your current décor. The 50 plus years of experience has enabled us to test all reclining chair designs thoroughly thus allowing us to continuously ensure that we are providing the highest quality and most comfortable chairs we possibly can.